Home / Adviart Blog / Consult your inner child. Consult your inner child. This adviarter took this shell because it was “perfect”. The advice coming from the perspective of growing into adulthood. “As we grow, we are let the world burden us, and we slowly build a shell around ourselves to protect us from the elements. 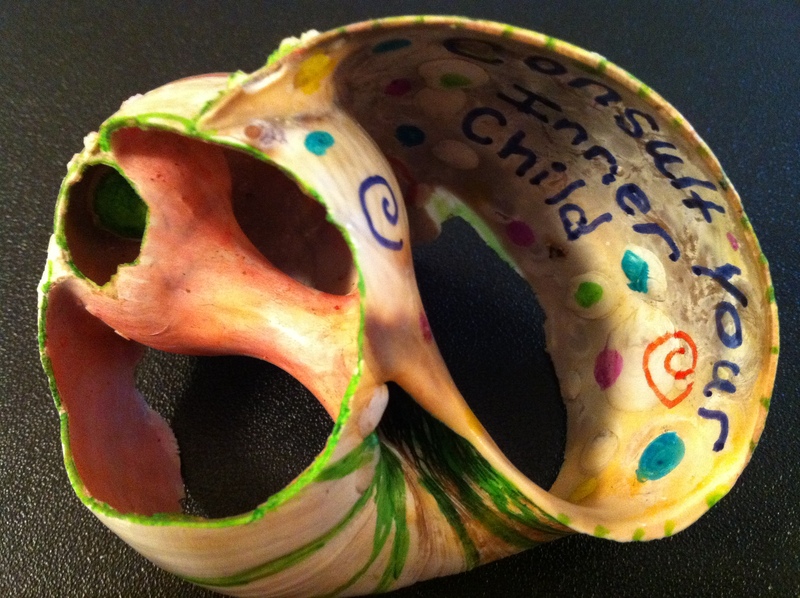 We tend to stifle the inner child as a form of guarding our vulnerabilities–this shell is about breaking through those self-imposed barriers, and harnessing the creativity and playfulness from within.” The spirals represent growth. The green symbolizes being grounded. The pink symbolizes “playfulness” and the polka dots symbolize being youthful. There is a mix of words and design on this shell–the whole space of the shell completely utilized in expressing this advice. Creativity is probably one of the assets I admire most in others. I think all people can be creative and this adviarter addressed this perspective very well by noting the influence of the shell that grows over time around ourselves to protect. I think back to childhood–when I was most creative –or so I thought. Childhood presented some of the same realities but I never recognized the need for a shell. Now, a shell is mandatory and pushing back the shell to allow the creativity is not only sometimes exhausting but very difficult to do in certain environments. Focus on your heart health. Slow and steady. I am listening. Continue to be courageous with your passion.